Combination is a selection of distinct elements without specific orders. Combination worksheets are diligently prepared as per the state standards and proposed for high school students. Unearth the usage of combinations in real-world scenarios. An array of topics, like listing out combinations, finding the number of combinations, evaluation, solving combination problems and more. 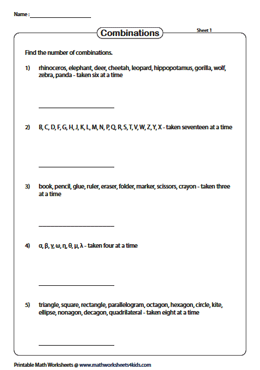 We also have a huge collection of Permutation Worksheets for practice. Jot down all the possible combinations of the habitual elements like names, numbers, shapes, alphabets, colors and so on! Write down the total number of possible combinations for a set of objects taken at a time. 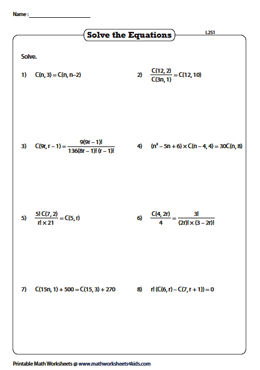 Each worksheet consists of five problems. 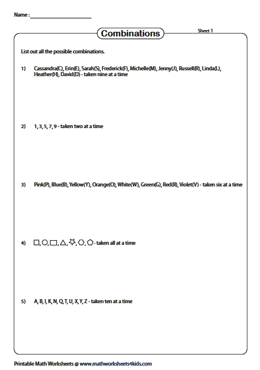 These worksheets include problems with simple expressions involving combinations. Students are required to simplify the expressions using the combination formula. 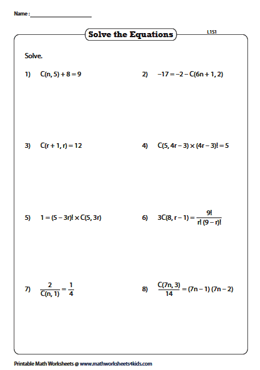 Level 2 worksheets include more integrative problems involving basic operations. Using the formula for C(n, r), evaluate the expressions. 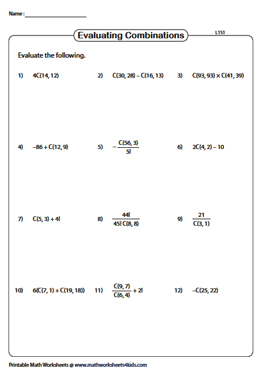 Access this set of combination worksheets to find the unknown value in the equations using the formula for C(n, r). 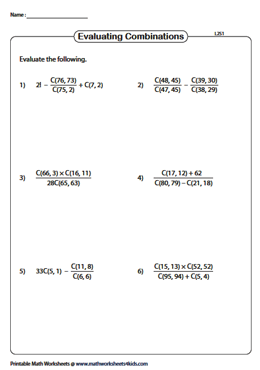 These Level 2 worksheets encompass challenging problems when compared to level 1 worksheets. Solve problems using the combination formula to know the unknown parameters. 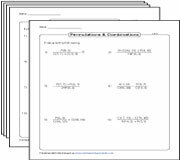 These permutations and combinations worksheets consist of an array of exercises to identify and write permutations / combinations, twin-level of solving equations and evaluating expressions.